Jenni Murray chats to three of the oldest baronesses in the House of Lords; Thirty years after the strike, the wives of ex-miners share their experiences. "You're not allowed to die in the House of Lords": 3 Baronesses on life in the Lords. Jenni is joined by two former miner’s wives to discuss what the strike meant to them. 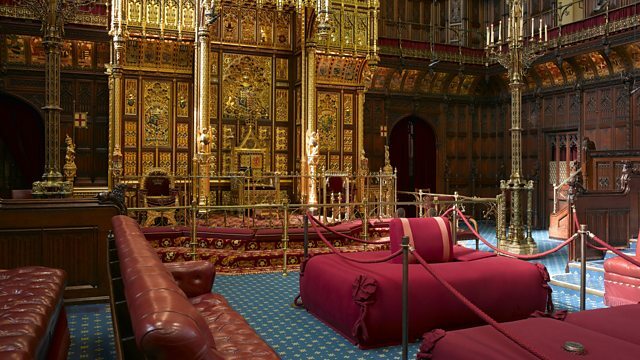 Three of the oldest female members of The Lords reflect on a life in The Second Chamber. Jenni speals Sally Green, on her new trilogy of young adult books. This week The Sun newspaper launched its Check ‘em Tuesday campaign to encourage women “to get to know their breasts”. Check ‘em Tuesday is going to feature on Page 3 and will be run in partnership with the breast cancer awareness charity CoppaFeel. Readers are going to be encouraged to post photographs of themselves on social media sites feeling their breasts. Can using sexualised images of women create better awareness the disease? Jenni talks to the founder of CoppaFeel, 28 year old Kristen Hallenga who has incurable breast cancer. This week marks the thirtieth anniversary of the miner’s strike. Back in 1984 there were more than 180,000 miners in the UK working in 170 coal mines. Today there are fewer than 2000 in just five mines. Arthur Scargill and the NUM called the strike to protest against proposed mine closures and for 12 months the news was dominated by conflict in the coalfields as some miners chose to work whilst others became flying pickets and large numbers of police were called in to keep the peace in the pit villages. Jenni is joined by two former miner’s wives to discuss what the strike meant to them and their communities and how it has changed their lives. This week, “Half Bad”, the first in a new trilogy of young adult books in the fantasy genre that brought us Twilight & the Hunger Games is published. The author, Sally Green, has been making headlines with her £1 million advance. It’s set in the present day where white and black witches live alongside humans. But there are no broomsticks or magic wands. White and Black witches are divided by hatred and united by only one thing – fear of a boy descended from both sides. Nathan is a ‘half code’ born of a white witch mother and black witch father. The story follows him on his journey into adulthood, which lays bare the best and the worst of humankind. Three of the longest serving and oldest female members of The Lords join Jenni to reflect on a life spent in The Second Chamber. They defend its function and discuss their most striking lmemories of witnessing history being made in The Upper House. Baroness Sharples (Cons) , Baroness Rendell of Babergh (Lab) and Baroness Warnock (Cross Bencher) share their views.